It was until mid April of 2011 then I knew that the gameplay of the "Cut The Rope" games is slightly different for different devices, like between iPhone 3G and iPhone 4/4S/5, etc. 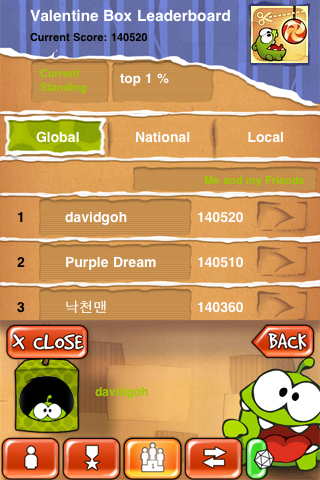 When using iPhone 3G (like my old "davidgoh" Crystal player account), you will have a small advantage over iPhone 4/4S/5 in the "Cardboard Box" category (read the article: Individual Level Top Scores for "Cardboard Box"). But for other boxes like "Magic Box", iPhone 4/4S/5 has an advantage over iPhone 3G. The advantage of iPhone 3G over iPhone 4/4S/5 is that bubbles rise up faster while the advantages of iPhone 4/4S/5 over iPhone 3G are that the ropes are more "springy" and Om Nom can stretch open its mouth slightly wider. Gameplay Differences for the iOS Devices. Later I learned more about the differences when I asked "Gregor Fran" some questions. He played the "SD" (iPhone/iPod Touch) version using iPhone 4 and the "HD" (iPad) version using iPad 2. He's a very good player who has a funny habit of ending his total scores for the boxes in nice numbers (00 or 50). He has upgraded to iPhone 5 when it just came out and even though the iPhone 5 has a longer screen, iPhone 4S and iPhone 5 can produce the same scores because the extra spaces at the top and bottom of the iPhone 5's screen are just left blank (only the background picture is stretched). But currently even the new game "Cut The Rope: Time Travel" supports iPhone 3GS and iPod Touch (3rd Generation) which I think will have some differences from the newer iOS devices. Moreover, they're porting the "Cut The Rope" games to more and more platforms and devices. For those platforms which use "mouse" and some older types of "Google Android" devices which don't support "multi-touch", you cannot perform multiple actions at the same time like the iOS devices, so you will definitely get lower scores for those levels where you can speed up the level completion by performing simultaneous actions. I first discovered the "different gameplay" problem when I saw the YouTube videos of another top player "dntn31" and his posts in a forum (no longer available) and actually he's using both iPhone 3G and iPhone 4 to play. His iPhone 4 scores for "Cardboard Box" were "mixed up" with some of his old scores from iPhone 3G when he upgraded to iPhone 4, that's why he could get slightly higher scores than me and "minibilibob" for "Cardboard Box" in both the full and lite (now called "Cut The Rope Free") versions. He didn't intend to cheat actually because he didn't know about the differences then. I should have searched the internet earlier on so that I didn't have to waste time trying to figure out how he could have obtained the extra points. Unfortunately, the scores for 3 boxes "Cosmic", "Valentine" and "Toy" have been "mixed up" when the order of boxes was changed in "Cut The Rope" ver. 1.6 (read: Changes to Order of Boxes in "Cut The Rope" ver. 1.6), so you cannot really compare the scores for these 3 boxes now because some players have replayed the levels in them, resulting in higher scores than usual. Read article: NEW "Score Mixup" Bug in "Cut The Rope" ver. 1.6. 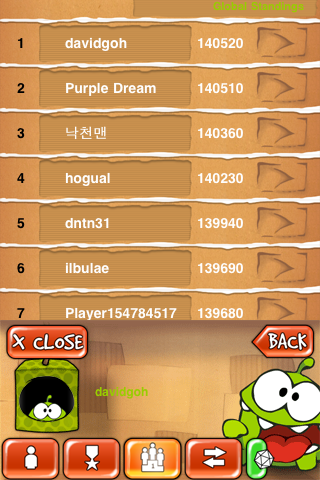 "Purple Dream" is a very strong player who used iPhone 4. He/she only played for a few days in the "DJ Box" (11th box of "Cut The Rope") and the "Handy Candy Box" (6th box of "Cut The Rope: Experiments"), so his/her scores for these 2 boxes are surprisingly low. Maybe "Purple Dream" is busy recently. "minibilibob" hasn't been playing for a long time and "dntn31" is busy recently (he only played for a few days in the recent boxes). Good articles! And nice too see you somewhere else than on Crystal. We missed you on the now shut down forum. I didn't know all the top players were there until end April (just explained to "dntn31" who sent me a Facebook message yesterday). Later I was too busy replaying all the levels so I didn't join in the chats. I created this blog so that people like the other top scorers who didn't know the existence of that forum (e.g. Din Jessada) would know how some of us achieved the top scores. I only knew that your scores were 100% real (in ver. 1.0 the top 3 scorers were you, me and "vinceez") but I suspected the others because their Crystal achievements were not 100% (probably because they "jailbroke" their iPhones or due to some Crystal bugs). And also all the other casual players who only aim for 3 stars would know that our scores are 100% real.